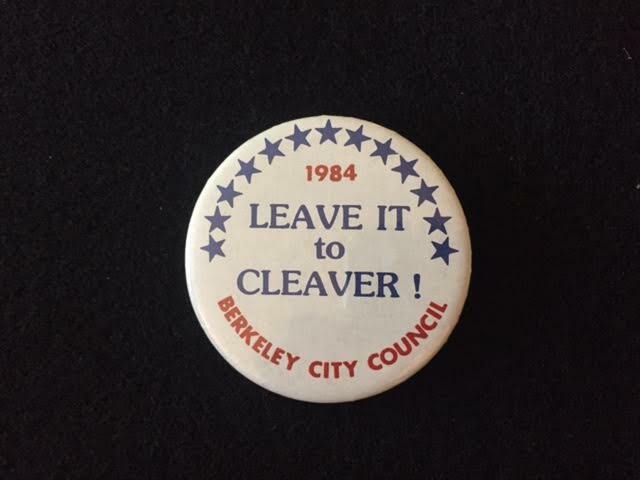 Berkeley was once all about buttons. 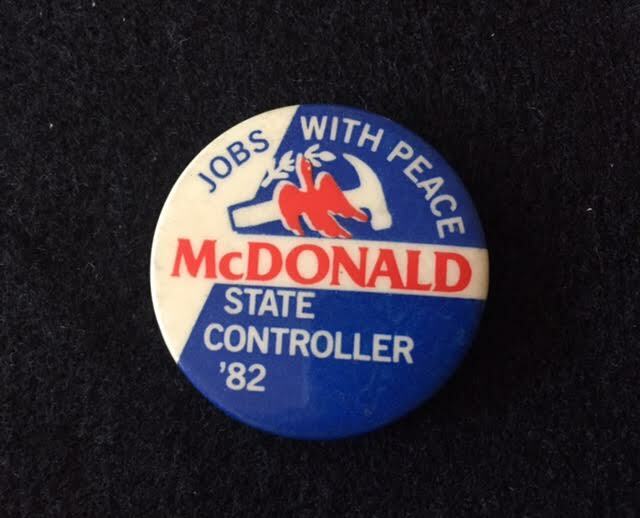 I too was once all about buttons. 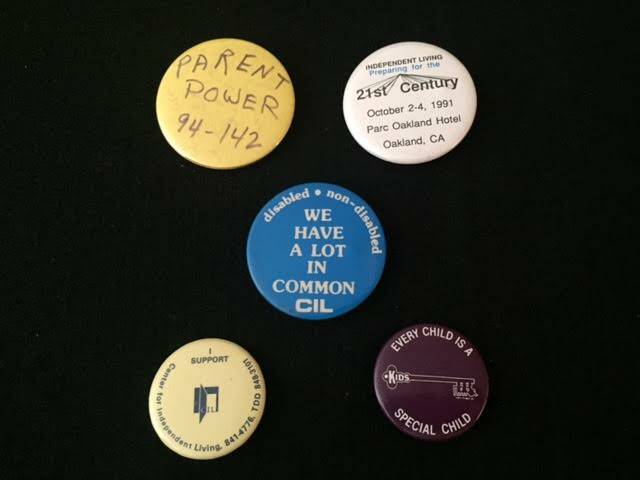 When I left the United Farm Workers in 1980, I had one of the best collections of United Farm Workers buttons around. 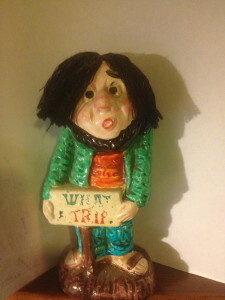 Photos of my collection can be seen here. It’s all about me! 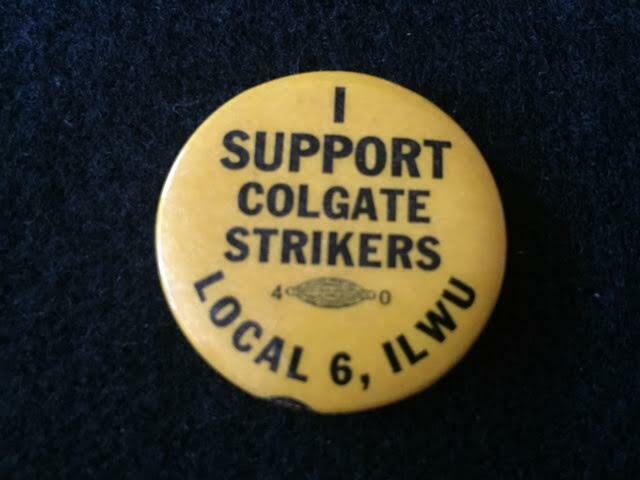 My first wife Janet’s Uncle Don MacLeod, along with Janet’s father (Don’s younger brother Stuart MacLeod) were lifetime workers / leftist union activists at Durkee’s Foods and Colgate Palmolive in West Berkeley. In 1937, when Janet’s Uncle Don was 25 (then a member of the Young Communist League) he joined up as a volunteer and headed off to Spain as a member of the Abraham Lincoln Brigade. Which of course became a focal point of his life. 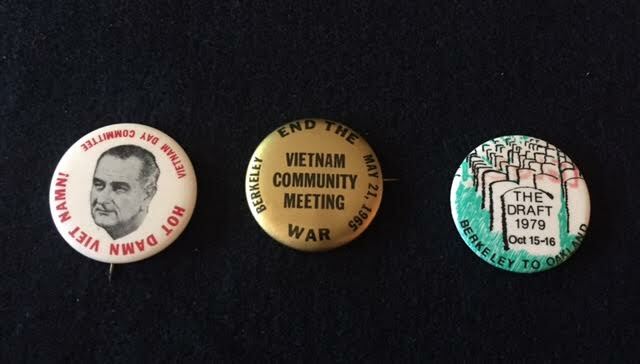 Don collected political buttons from the 1930s to the 1960s. 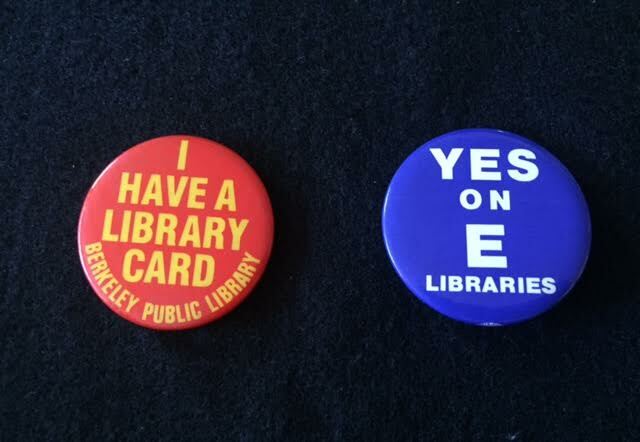 I began collecting political buttons when I first got to Berkeley in 1969. 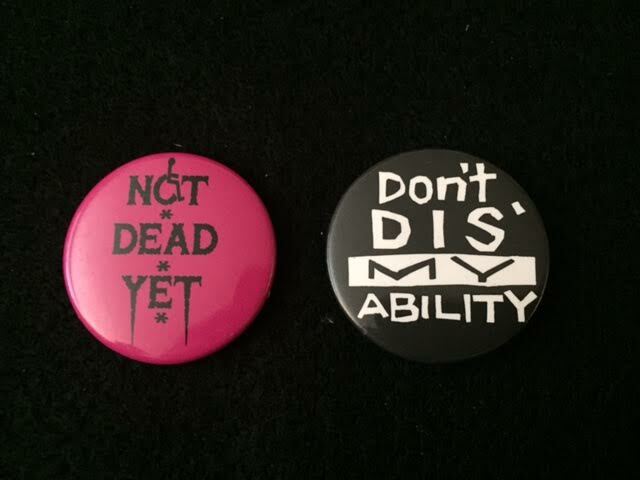 When Don died in 1987, his family gave me his button collection which I added to mine. 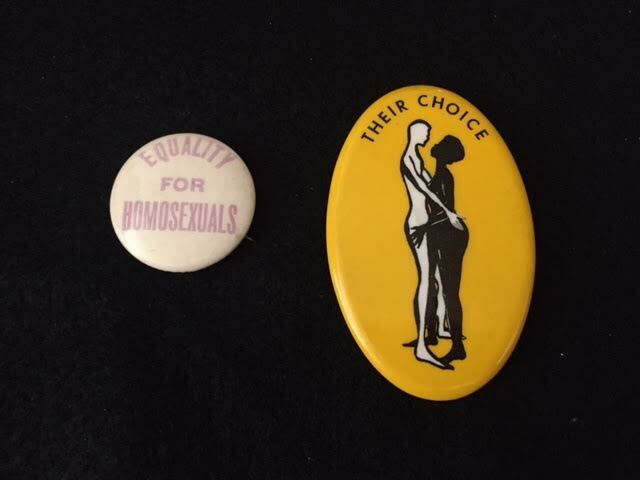 Resulting in a collection of thousands of buttons, covering a vast array of movements and causes. 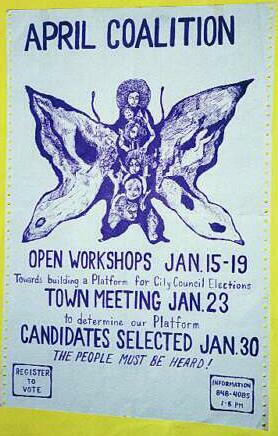 From feminism to farm workers, labor and civil rights, political campaigns, you name it. 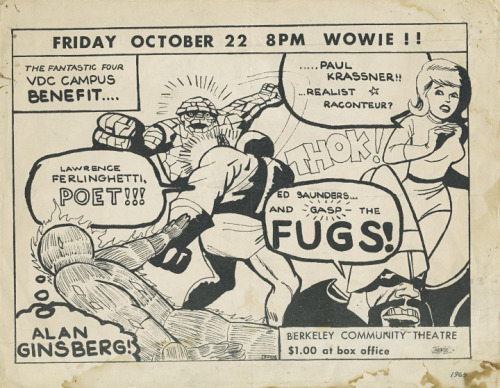 Stein himself is a representative of politically progressive Berkeley. Here, a young, righteous, finger-pointing Stein lays into the City Council. Go Ken! 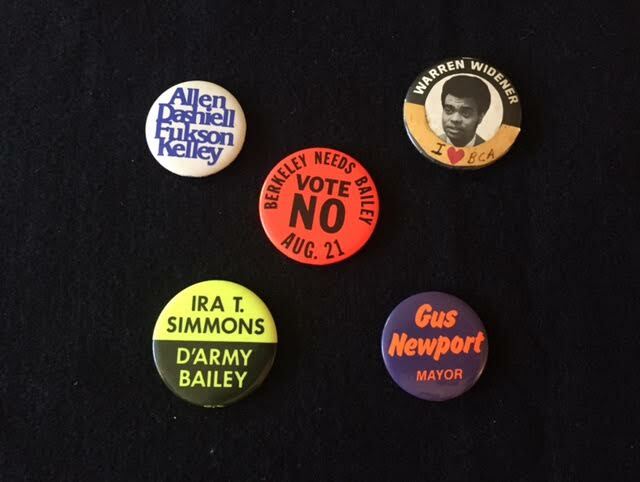 From his collection, here are some that directly relate to Berkeley. 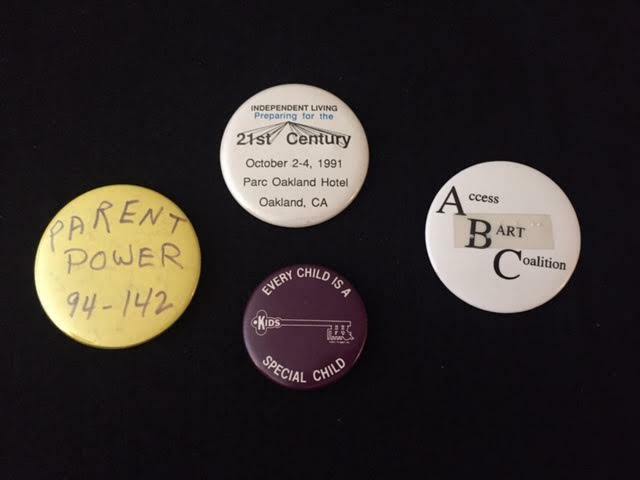 These buttons are from the early days of student activism at Cal. 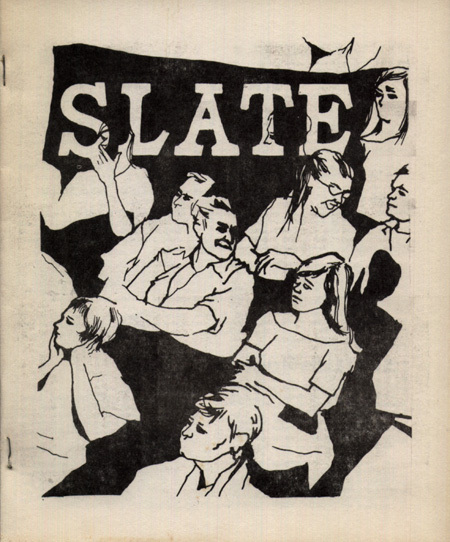 SLATE was a left/radical student organization on campus from 1958 until 1966. 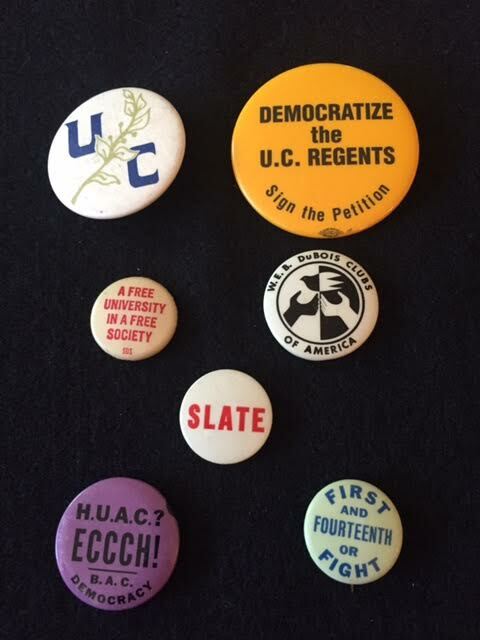 SLATE led demonstrations against the House Unamerican Activities (HUAC) meeting in San Francisco in May, 1960. 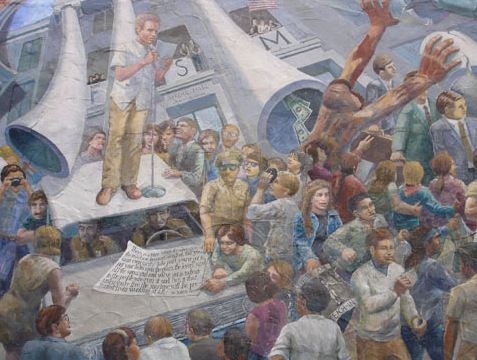 The Free Speech Movement rocked the campus, California, the United States,and the world in 1964. 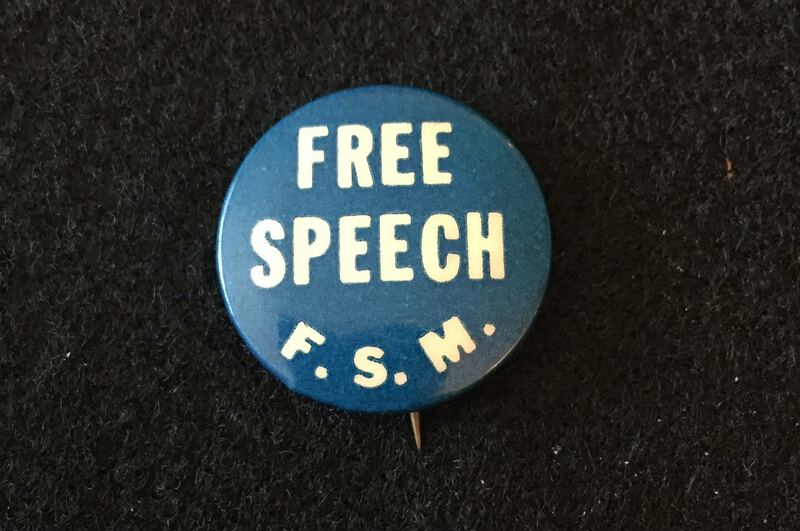 One of the themes of social protest in the early 1960s and the Free Speech Movement was the dehumanization of many social interactions, hence the reference on this FSM button to computer punch cards. Herman Hollerith invented the punch card to tabulate the 1890 census. 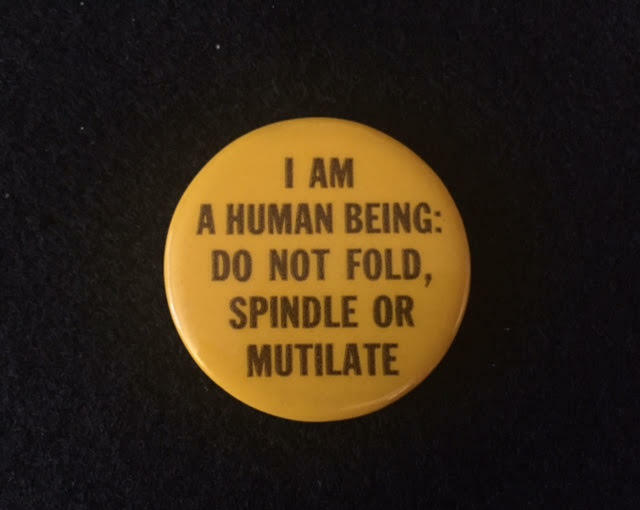 Until the 1950s, punch cards were the primary medium for data entry, data storage, and processing in institutional computing The phrase “do not fold, spindle, or mutilate” and the feelings it represented outlasted the technology and the billions of cards on which it was printed. 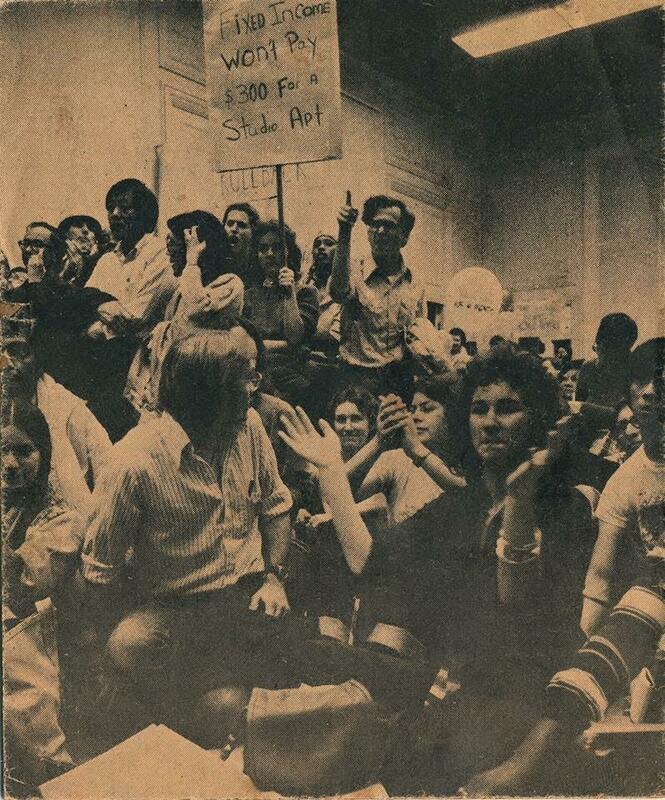 There was a close relationship between the student movement at Cal and the Civil Rights movement. 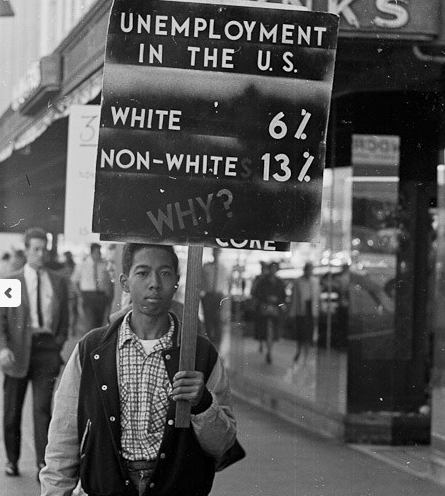 The Bay Area chapter of the Congress on Racial Equality led picketing at a number of Bay Area department stores and supermarkets. 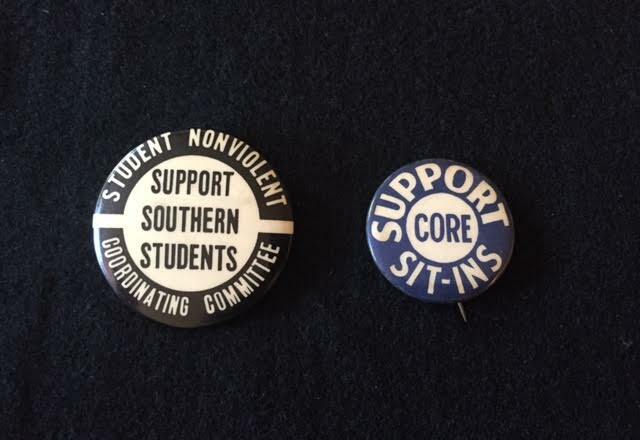 Some of the leaders of the FSM had spent the summer of 1964 in the South with SNCC. 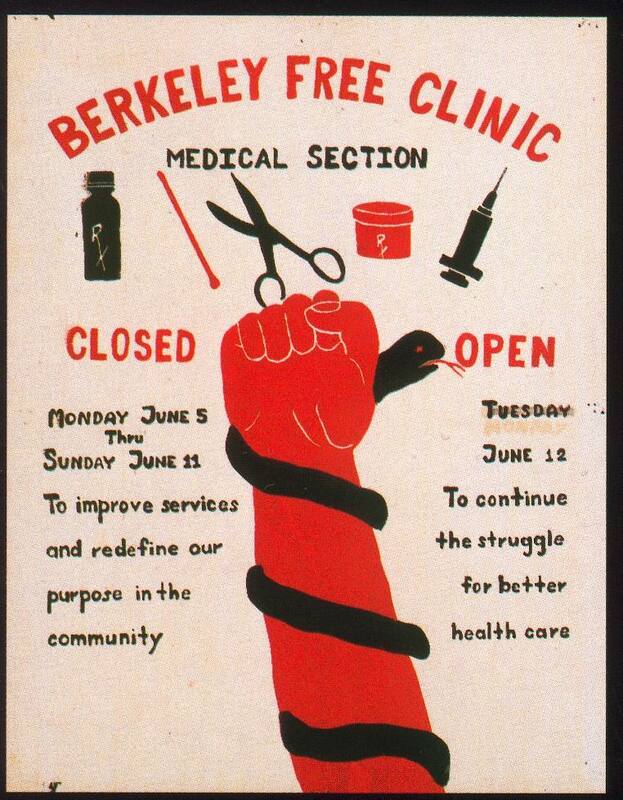 Berkeley was an early center for opposition to the war in Vietnam. 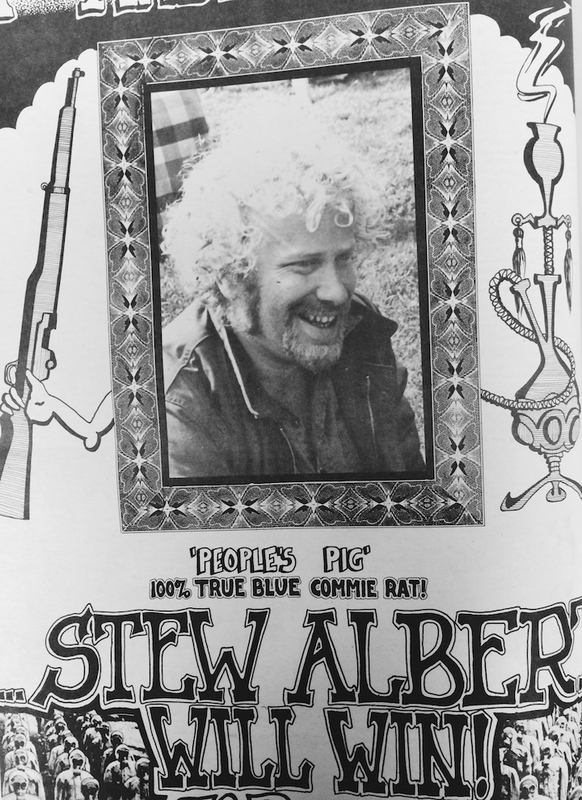 The Vietnam Day Committee was formed by Jerry Rubin, Paul Montauk of the Socialist Workers Party, Abbie Hoffman, Stew Albert, and others in May, 1965. 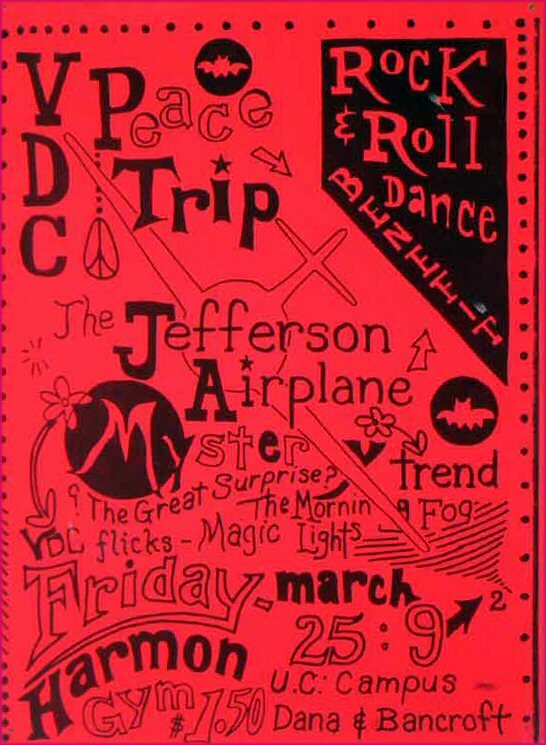 It was one of the first anti-Vietnam-war groups in the United States. 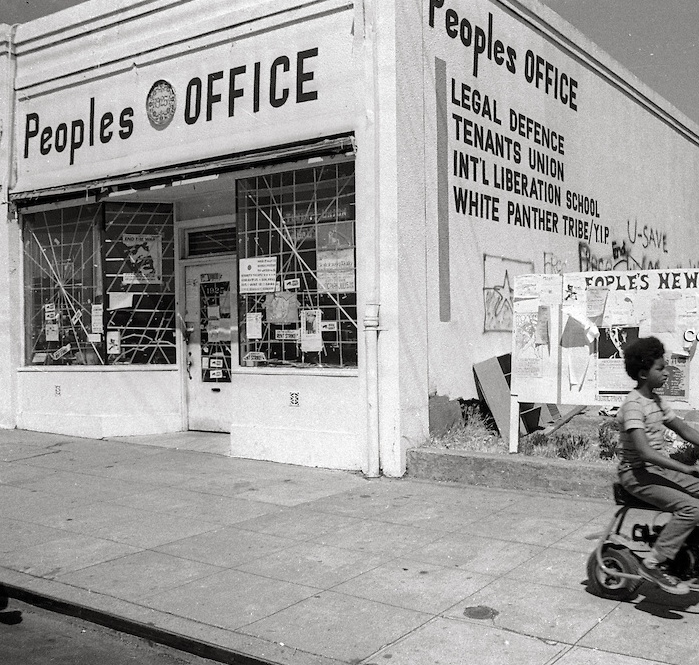 Their offices were at 2407 Fulton. A bomb destroyed much of the office. 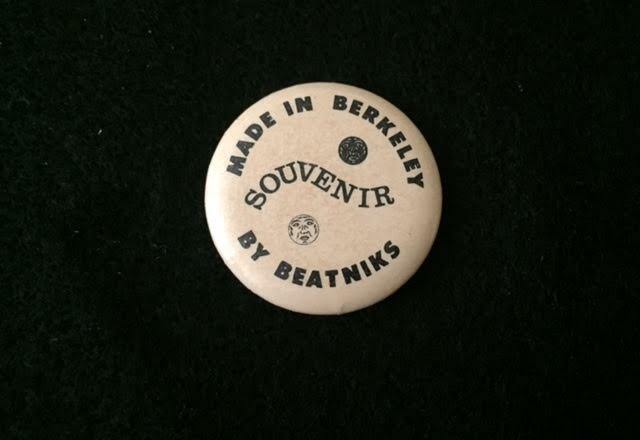 This novelty button is from approximately the same era, after we called beats beatniks and before we called hippies hippies. 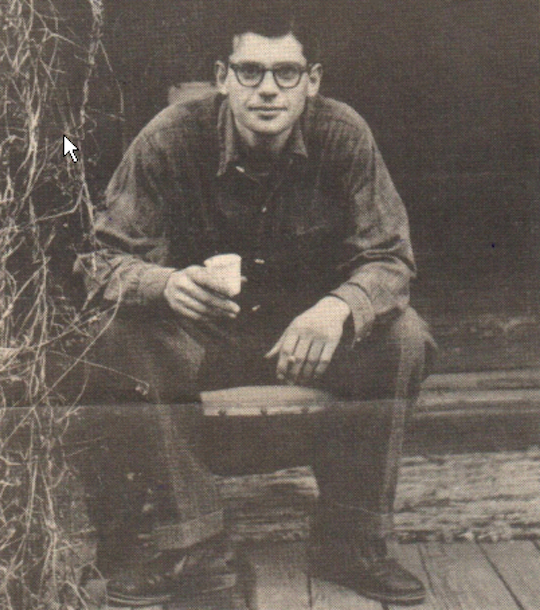 We actually had a Beat presence in Berkeley – Allen Ginsburg (pictured above), Jack Kerouac, and Gary Snyder to start with. And a vibrant folk music scene. 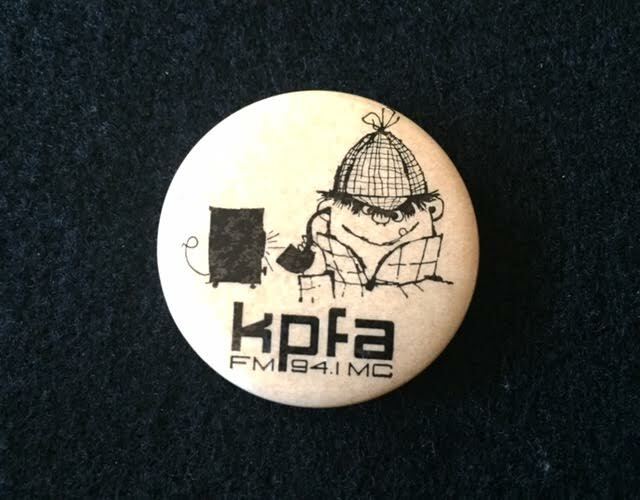 But I don’t think that’s what they were talking about on the button. 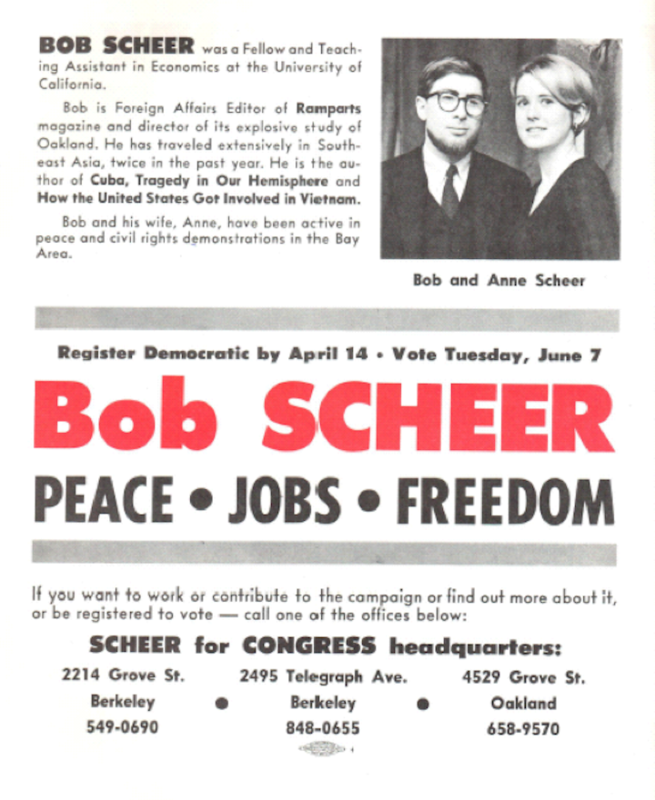 I have posted about the campaigns of several radicals for political office in Berkeley, including Bob Scheer running in the Democratic primary for Congress in 1966, Jerry Rubin running for mayor in 1967, and Stew Albert running for Sheriff in 1970. 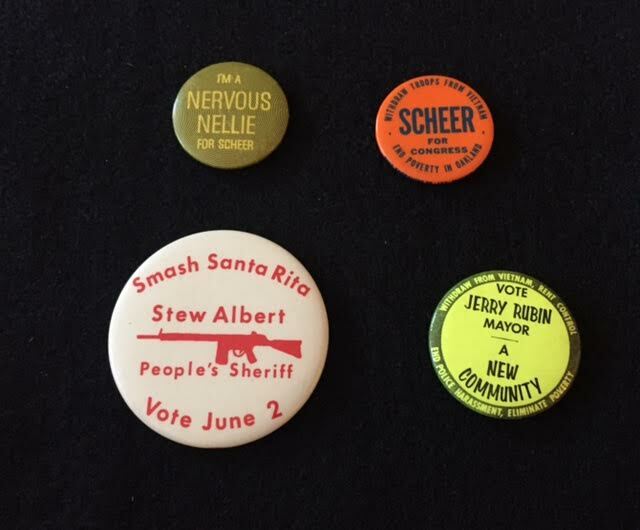 Stein’s collection includes buttons from three of the four campaigns I have written about, missing only Bill Miller’s campaign for mayor. 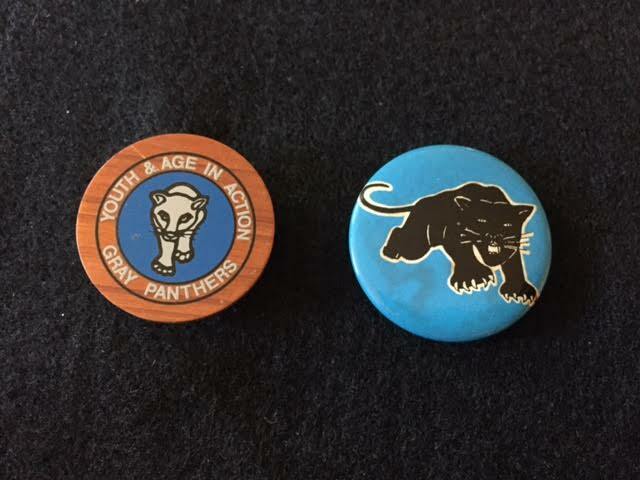 The Panthers were a presence in Berkeley, both the Black Panthers (organized in 1966) and later the Gray Panthers (organized in 1970). 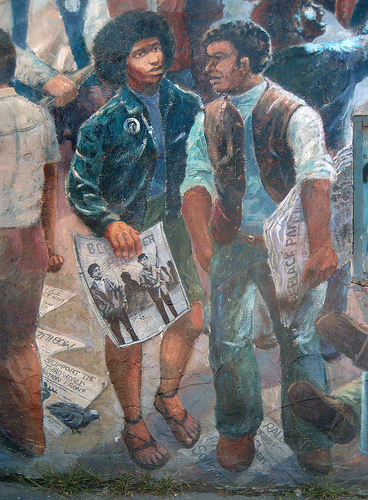 The Black Panthers were definitely part of the Telegraph Avenue mix – shown here in Osha Newman’s People’s History of Telegraph Avenue mural on Haste just above Telegraph. 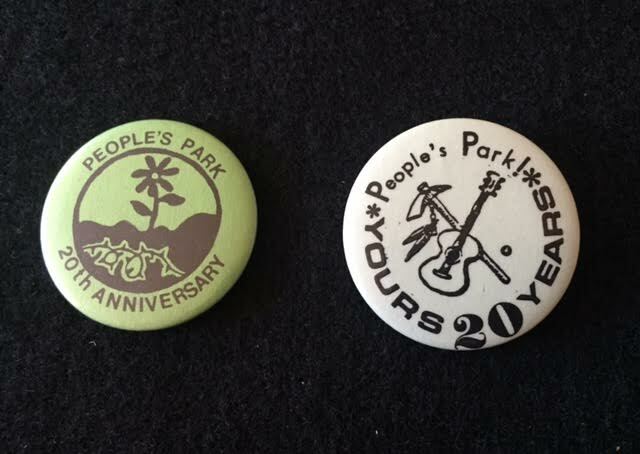 And then there is People’s Park. 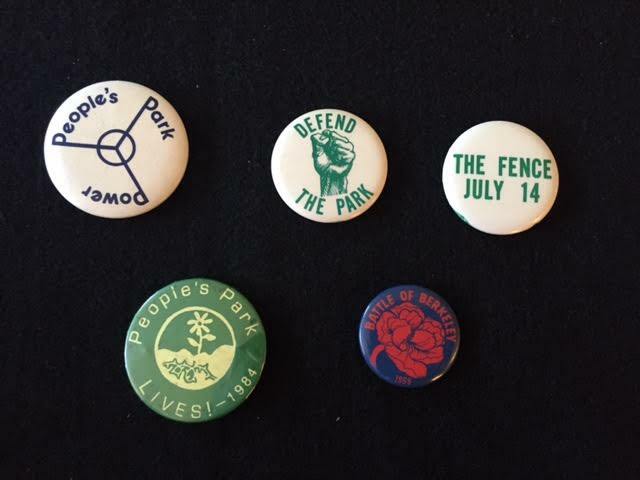 The struggle for People’s Park and Governor Reagan’s bloody response to protestors were significant markers of the cultural and political battles of the late 1960s. 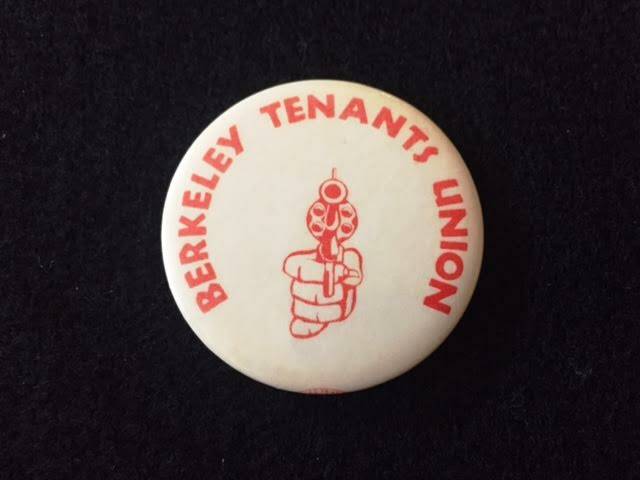 The Berkeley Tenants Union exists today but the fervor and fury of its early years in the late 1960s and early 1970s is no longer present. 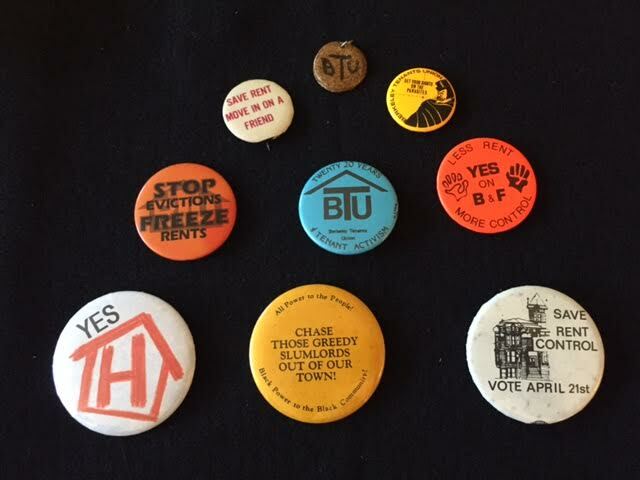 The bottom two buttons were designed by early BTU member Randy Elliott. 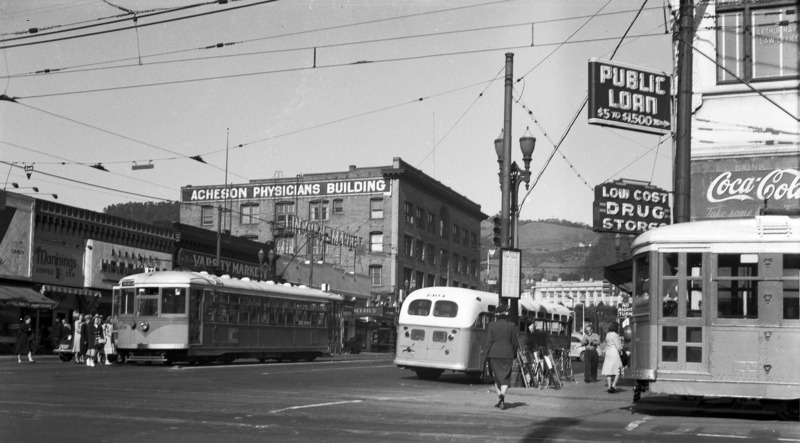 Stein mentioned Uncle Don working at Colgate at 7th and Pardee in West Berkeley. 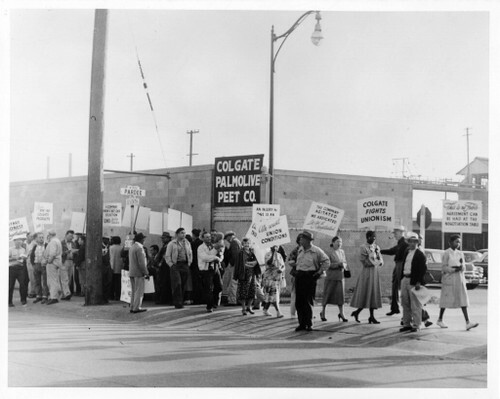 The Longshoremen went on strike against Colgate in 1961-1962. Union strong! 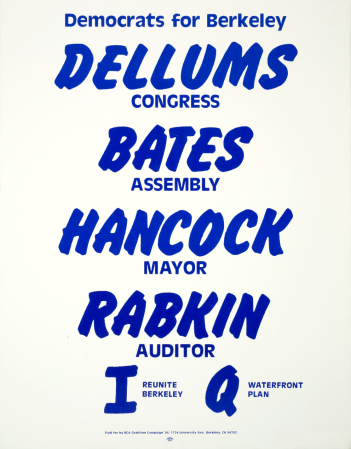 The plant continued to manufacture soap, glycerin, detergents, cosmetics, and related products until 1982. 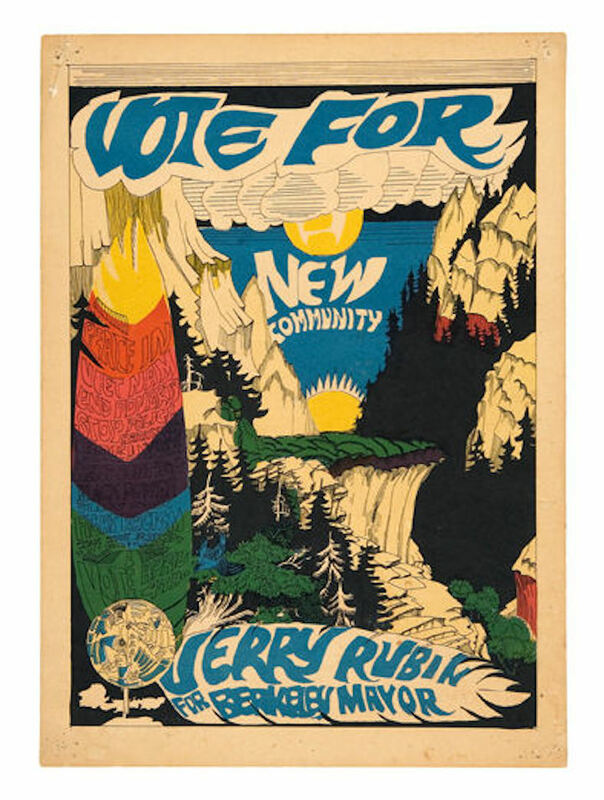 The 1970s were a turbulent time in Berkeley politics, as we transitioned from a Republican-dominated City government to a left-leaning Democratic party-domianted government. Two candidates deserve special attention. 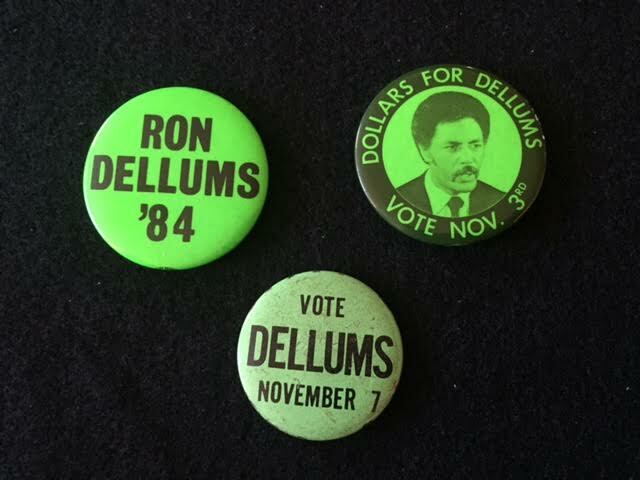 Ron Dellums was elected to Congress in 1970, an early and prominent victory for progressive. 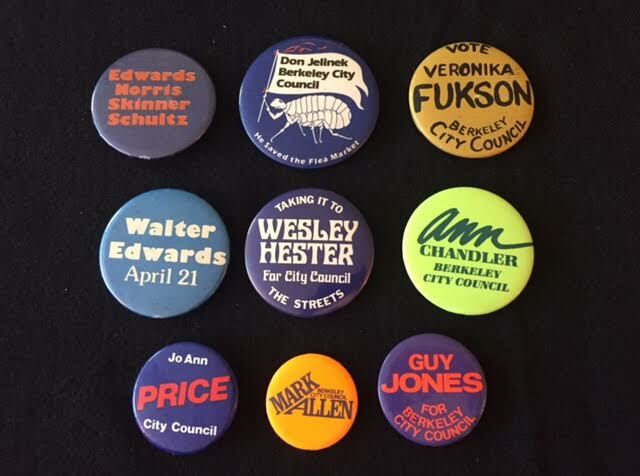 He had served on the Berkeley City Council from 1967-1970. 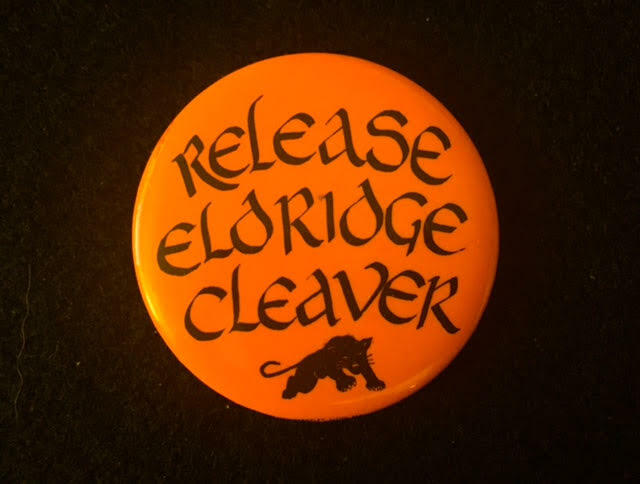 Eldridge Cleaver ran unsuccessfully for City Council in 1984. His life journey had taken him from the ex-convict Black Panther Minister of Information to conservative Republican Mormon. 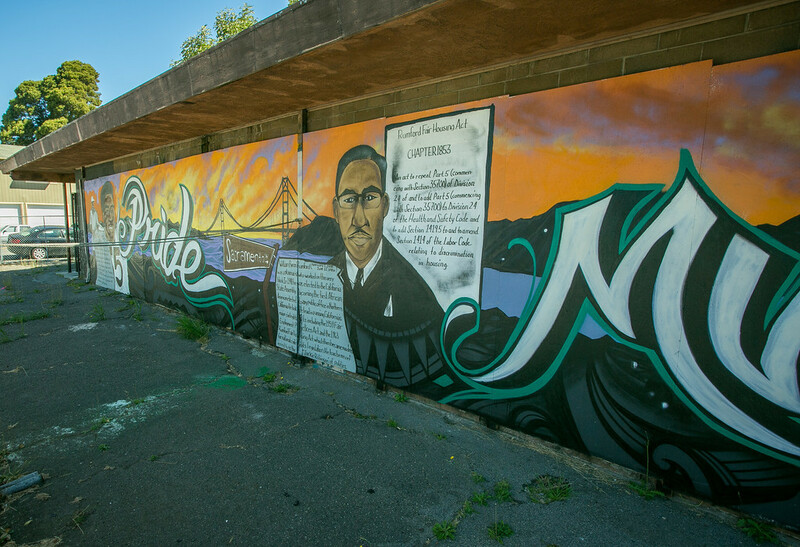 He may have renounced his radical Black Panther past, but we didn’t forget it. 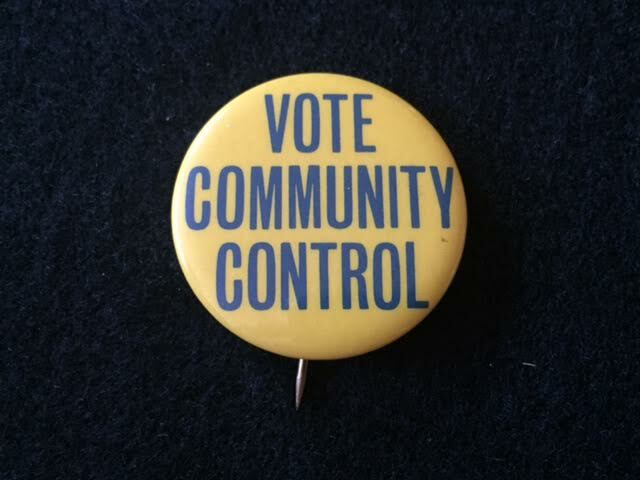 We had a button to remind us. 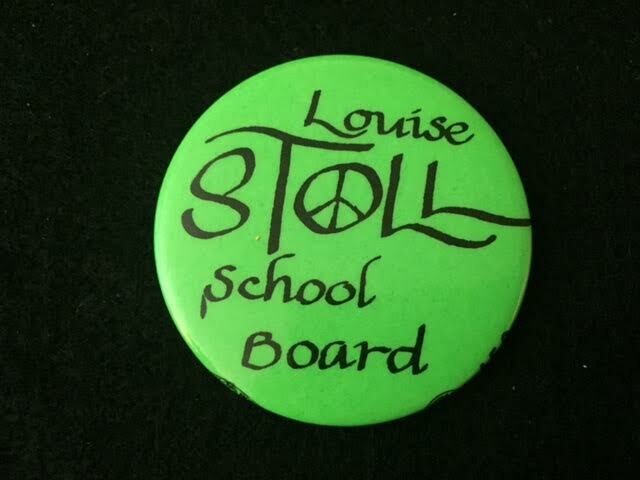 We have also taken our School Board elections very seriously, more seriously than in many communities. 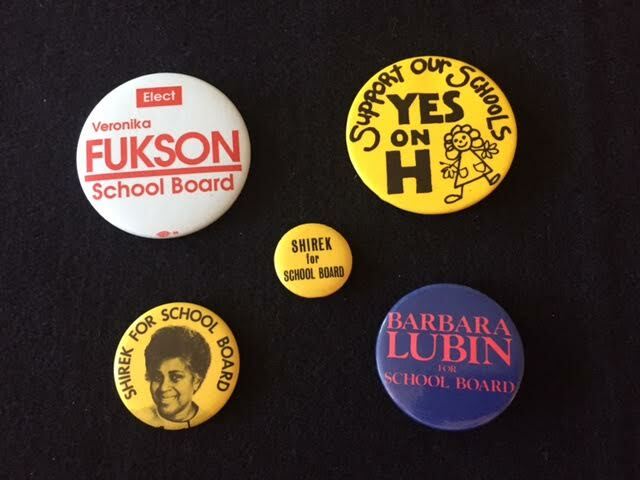 David Mundstock’s history linked above contains a detailed account of the politics of the school board and the political inroads made by Berkeley Citizens Action (BCA). 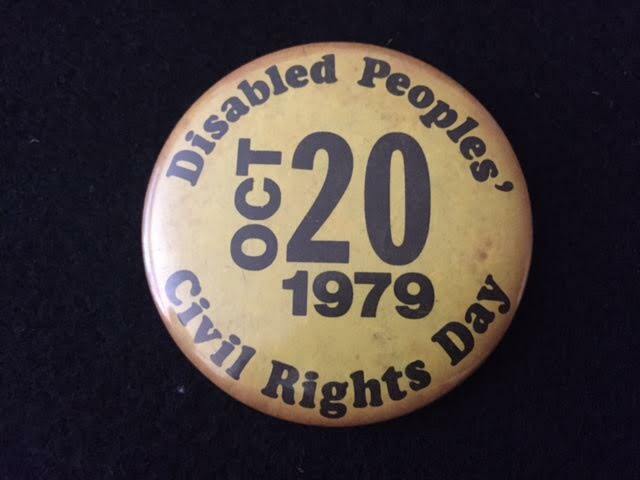 Berkeley has been an important locus in the fight for disability rights. 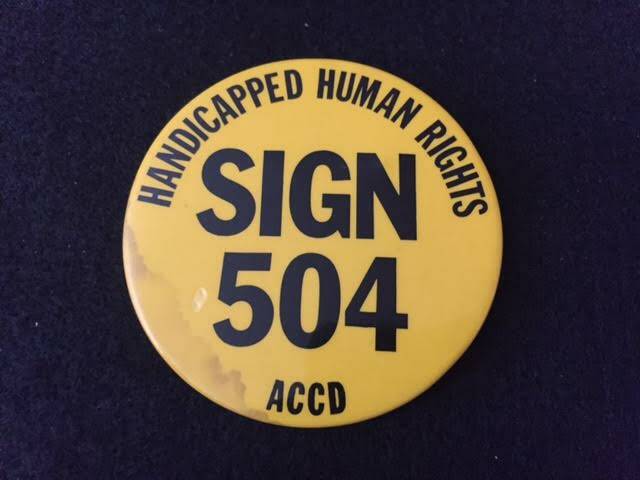 The reference to Section 504 is to the Rehabilitation Act, signed in September 1973. 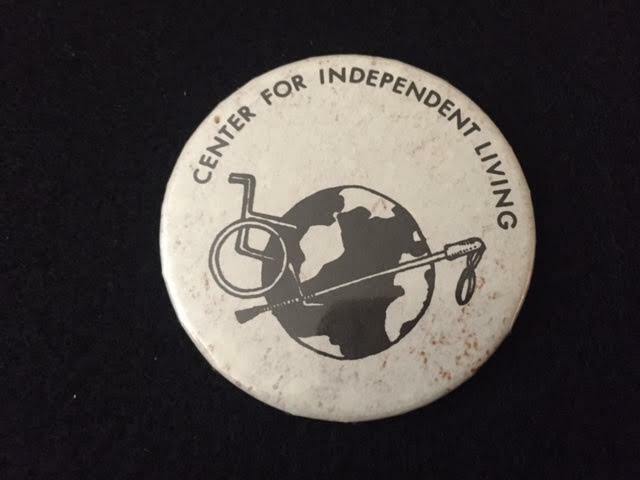 It provides: “No otherwise qualified individual with a disability in the United States, as defined in section 705(20) of this title, shall, solely by reason of her or his disability, be excluded from the participation in, be denied the benefits of, or be subjected to discrimination under any program or activity receiving Federal financial assistance or under any program or activity conducted by any Executive agency or by the United States Postal Service.” Although 504 was signed in 1973, the regulations implementing it had not been signed, so there were demonstrations all over the country in April 1977, the largest of which was in San Francisco, where over 100 people with disabilities and their supporters staged a 26 day sit-in. 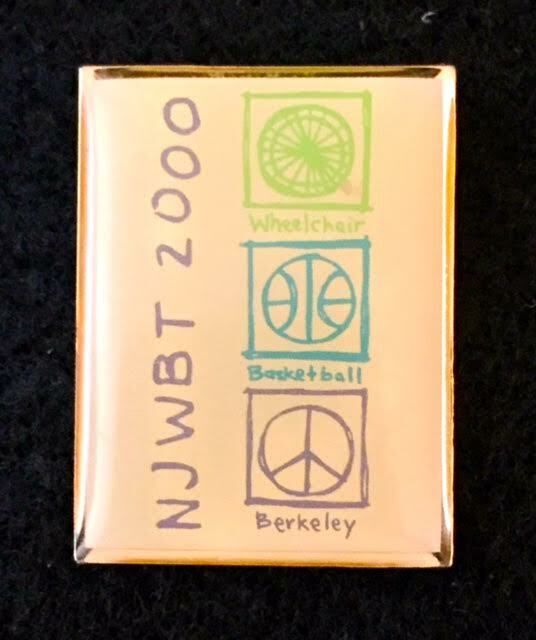 This button is from the 2000 National Junior Wheelchair Basketball Tournament in Berkeley. 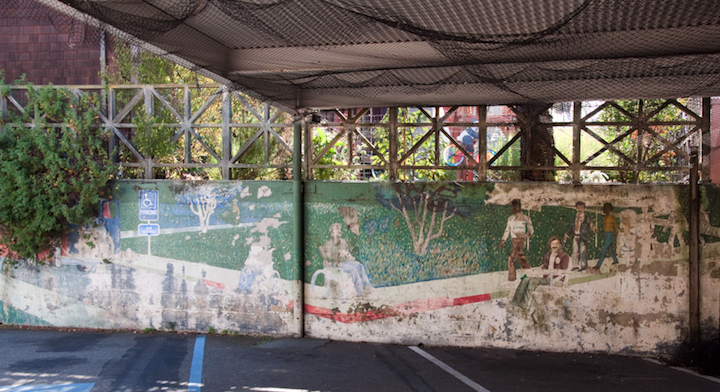 Wheelchair basketball has been played since at least 1946 – see the history of the sport here. 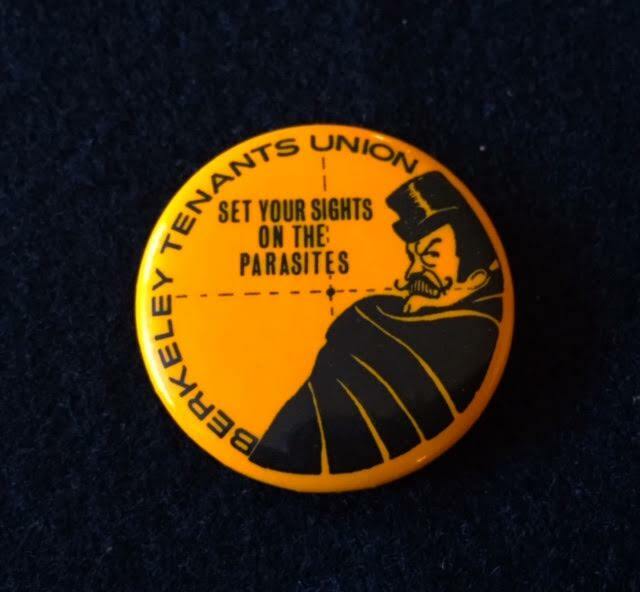 Housing – another big issue in Berkeley. 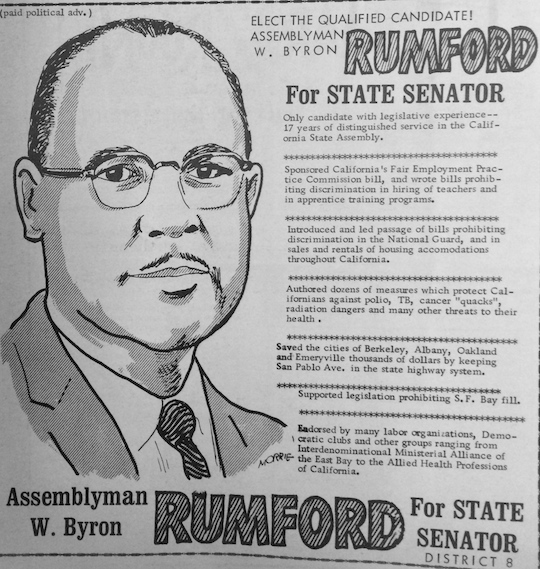 Berkeley’s William Rumford, the first African-American from Northern California to serve in the California legislature, sponsored the Rumford Fair Housing Act in 1963. 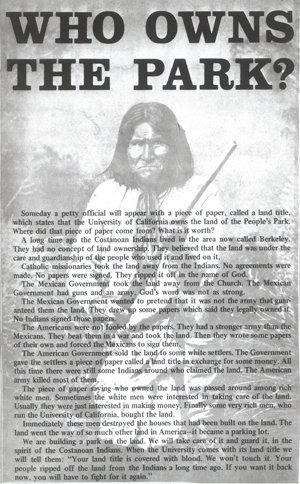 It prohibited racial discrimination by property owners and landlords. 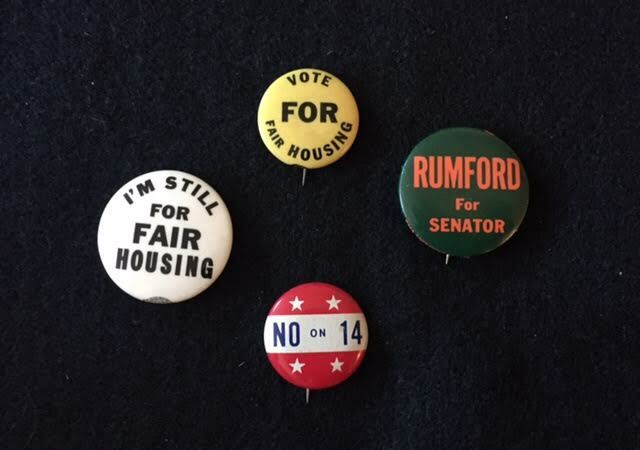 In 1964, the California Real Estate Association sponsored Proposition 14 to counteract the Rumford Act. 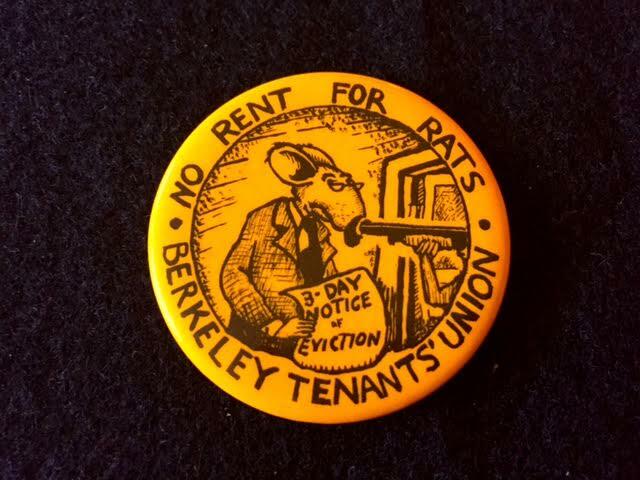 Proposition 14 passed – let’s let landlords discriminate! 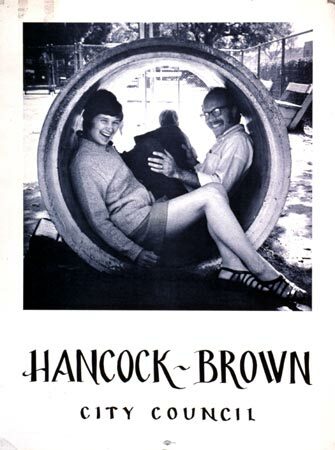 Governor Pat Brown authorized a legal challenge to Proposition 14, and the California and United States Supreme Courts found the Proposition unconstitutional. The John Birch Society and Ronald Reagan supported Proposition 14, and Reagan’s pro-discrimiinaition stance was one of the issues which enabled him to defeat Brown for governor in 1966. 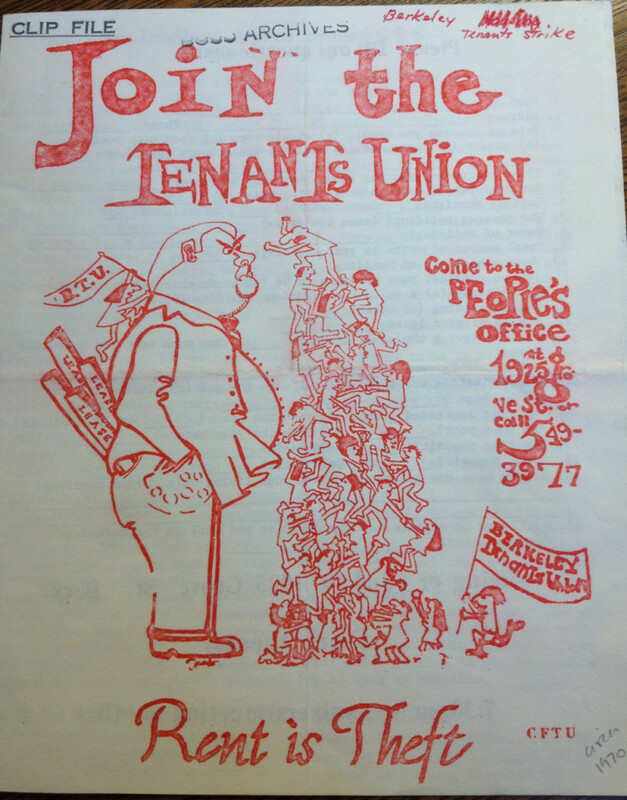 Almost lastly, a mishmash of other issues. 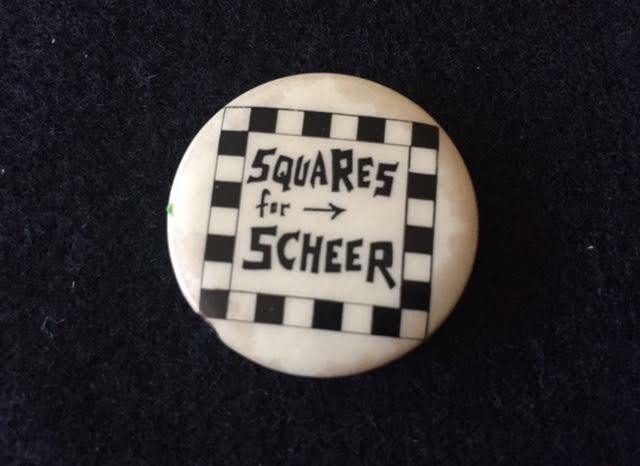 Last but not least – a completely apolitical button. 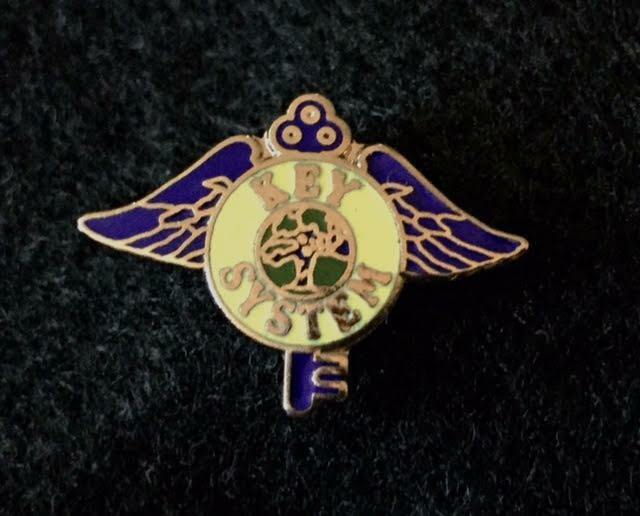 Our Key System, RIP – died in 1948. Apolitical unless you think Who Framed Roger Rabbit and view the dismantling of public transit as an anti-progressive political act. 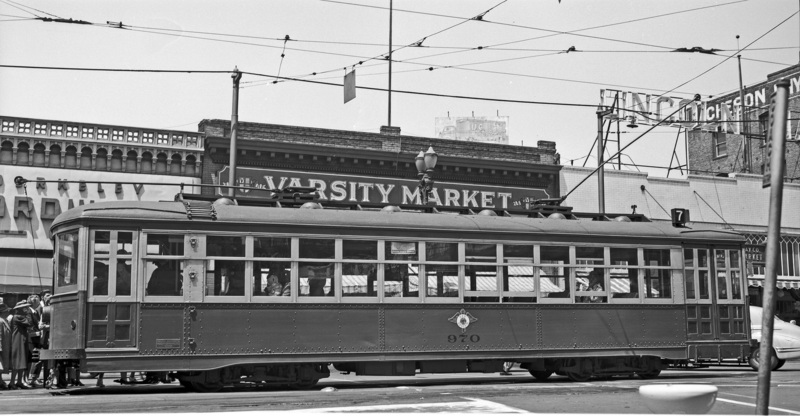 It provides an excuse to post these two stunning photos of Key System trolleys on University Avenue more or less at Shattuck. This represents a small portion of Stein’s collection. 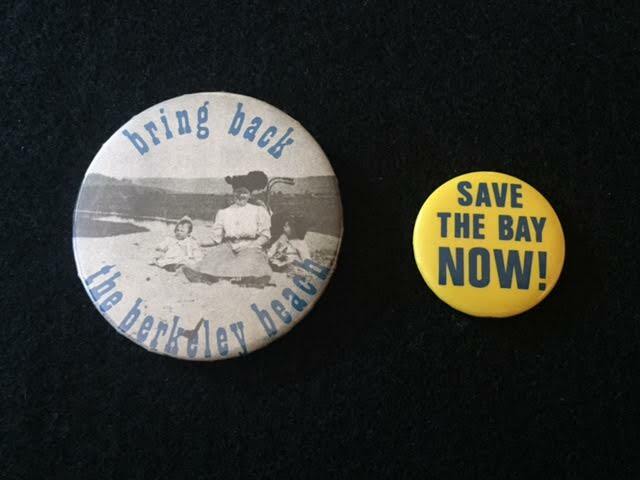 The Berkeley Historical Society has shown part of the collection. Rasputin’s created large cardboard versions for store decoration several years ago. 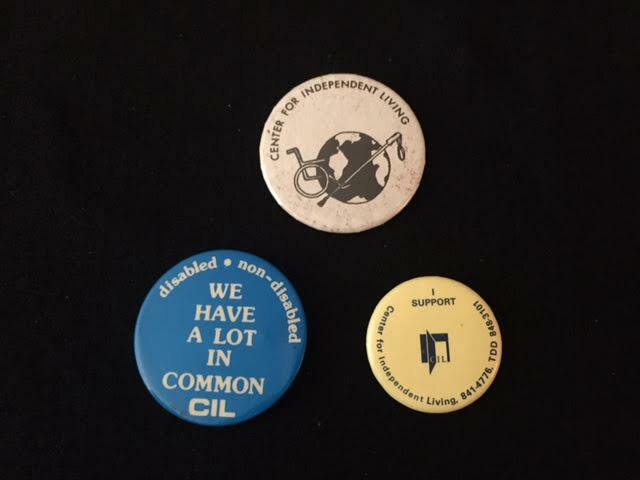 It is stunning to look at these buttons and compare and contrast with today. We actually cared then. 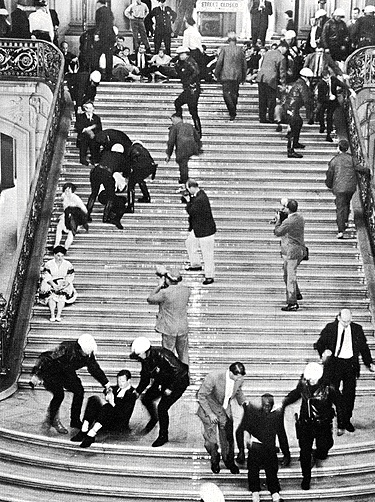 Sure, maybe we cared too much, maybe we were indiscriminate in our causes. 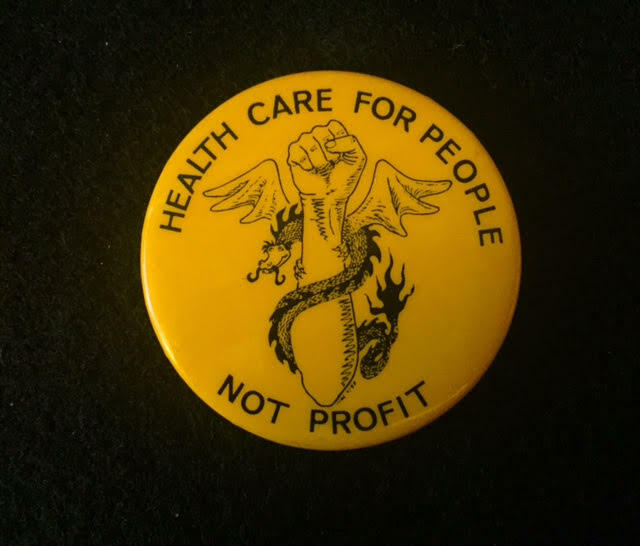 Granted – our embrace of the prison movement and our belief that Ho Chi Minh called it when he said that when the prison gates are opened the real dragon will fly out – maybe it was naive. Yes, the SLA was a step too far. Yes, as Charles Garry said, perhaps we were too tolerant of early signs of problems with Jim Jones and Jonestown. All that said – at least we had causes. Today we talk about transportation corridors and how many housing units we can build for people who are living here not because we are Berkeley but because they can’t afford to live where they want to live and just see Berkeley as somewhere to leave every day for work. We are not entirely without causes today, but it has surely changed. Okay, fine, whatever. 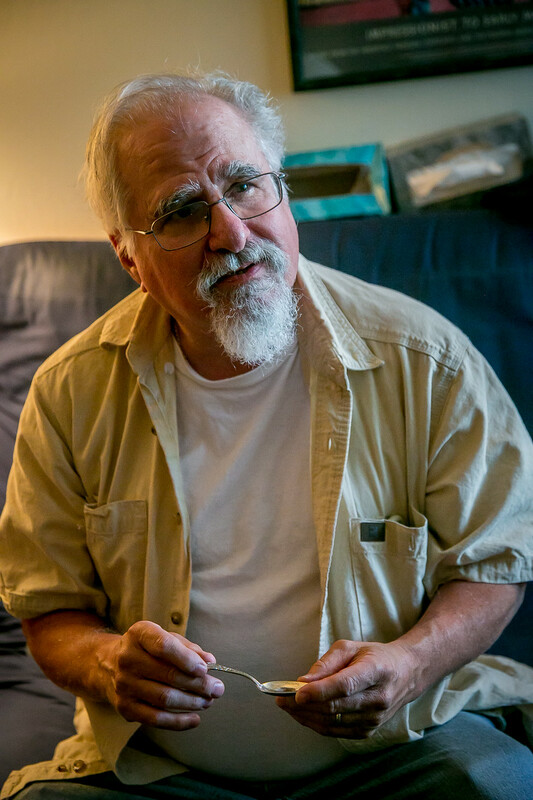 What about Ken Stein’s collection? I was at the Lucky Shop Ins. Shopping carts were filled to the brim, taken to the cash register but NOT checked out. BEFORE the cashier could ring anything up, they were told until blacks were hired I cannot shop here.